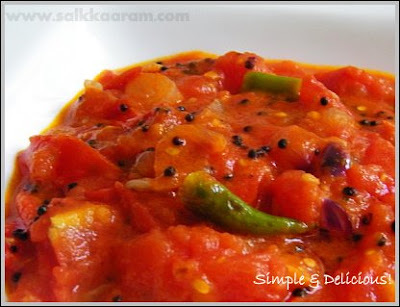 Thick Tomato Curry / Thakkali Chutney | Simple and Delicious ! Allow mustard seeds to splutter. Put chopped shallots and onions. Stir until it is semi transparent. Add green chillies and tomatoes. Add all the powders and salt. Place the lid and cook on a low flame. When tomatoes are mashed well, remove from fire. Normally , no need to add water. If you found it very dry, sprinkle little water while cooking. You can make this without adding shallots too, if you are lazy to peel them. Another Tomato special from you seens..what a colorful presentation there..would love to try this soon. 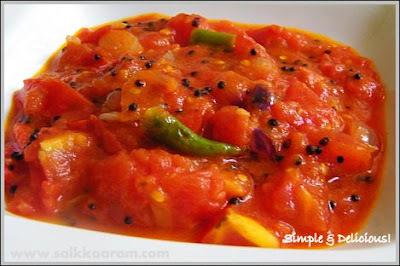 Tomato chutney sounds so delicious, i would love to have this with idli and dosas! Looks so delicious Seena! I make tomato curry in a similar way with grated coconut mixture. Great with rice! I can just imagine how delicious this is. Yummm.....looks so good. I love this for its versatility....you can eat it with literally anything - idli, dosa, chapati, rice or even spread it on bread. Now I know which blog to peek into when I have surplus amount of Tomatoes...love this chutney. I make exactly the same curry....It's really really delicious especially with fermented wheat dosa that we make here....shud go with other dosas too....Dint make it for some time now:)...Nice post..
Love this chutney so much.. nice click too..loved the layoout.. I am a tamilian married to a Punjabi. My hubby loves the fusion food I make (south indian dish +punjabi dish in one meal). I prepare a similar tomato chutney and also add 3-4 garlic pcs to it and grind it for 3-4 seconds in the mixi and add coriander leaves in the end. It tastes really yummy!I make even vatha kozhambu with tomatoes and my daughter wipes off 1 kg in one day!